1. Abhakti – Thinking that some other Mantra is superior or more powerful, chanting one Mantra and thinking about some other Mantra, having doubts over a Mantra; all these are signs of Abhakti or lack of devotion, and a such a Sadhak can never get success in the Mantra Sadhana. Forgetting a letter in the Mantra, wrong stresses like pronouncing "सी" as "सि" or pronouncing "ह्रूं" as "ह्रुं", etc. make the Mantra impure. If something like this happens, the Mantra Sadhana gets Khandit. Hence, chanting peacefully and carefully is extremely necessary because Mantra Japa done in hurry is bound to face such problems. 3. Kathan and Swapna Kathan – As I have mentioned in previous articles, one must not share his Mantra with anyone else. If the Sadhak tells his Mantra to someone else or if someone else hears you chanting a Mantra, or if you tell your Mantra to someone else in dreams then that Mantra becomes impure and one will need to take Mantra Diksha once again. Any mantra Sadhana needs to be done at a Gaushala, mountain, under Peepal or Banyan tree, near river or river bank, in your Guru's house, jungle, Teerth or in a Shivalay. If the Sadhana is done at home, one needs to refer to the Kurma Chakra. I have attached the picture of the Kurma Chakra. After looking at the Chakra, stand in the Center most place of your house. Then, look at the Kurma Chakra and create imaginary separations according to each bracket size. After, that, find the first letter of the name of the city you are presently in. Then, find the letter on Kurma Chakra and go at that place in your house. The place you've now reached is the place where you must do the Mantra Sadhana in the house. This place is considered as mouth. Doing it in the bracket next to mouth will decrease your life, give failure in the Mantra Sadhana and doing it in the opposite directions of your mouth will kill you. 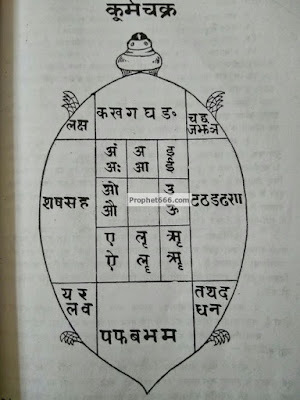 For complete detailed knowledge and information on Mantra Sadhanas, please see the section on – Performing Mantra Sadhanas. Do you have articles on Guru Dattatreya Mantra Sadhanas(By method of purushcharan). Which can be done for Guru Kripa and overall success in sadhanas ? but I dont know the Dhyaan , Nyaas and viniyog for that particular mantra containing 3 beej mantras of pran pratishtha . 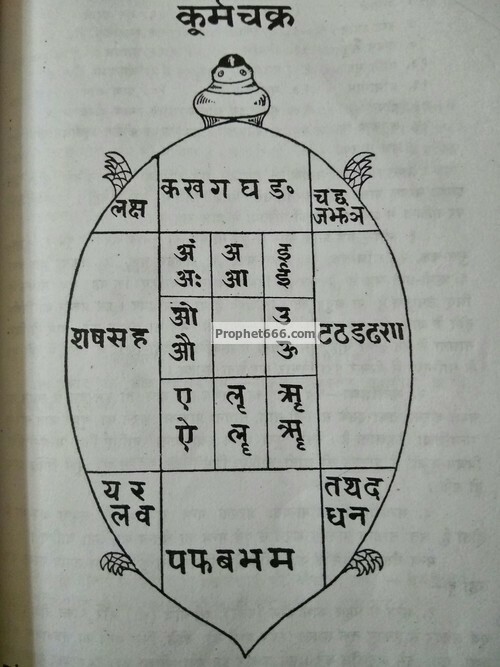 Ashok sir, I am 11 class student and suffering from Sade sati as well as shani mahasabha ,which mantra should I do to nullify it's effect and be successful in my life ? Just chant Hanuman Chalisa 11 times at dusk and go to a hanuman temple after that. Direction must be north and light incense sticks during recitation.